Although this new limited edition nail polish duo, Belle de Nuit, was created as part of YSL's Fall 2010 Beauty collection, I just could not resist picking it up to wear now! 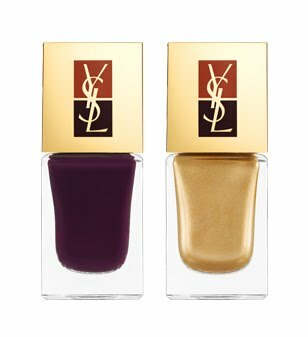 I first fell in love with these colors after seeing the breathtaking images from a French Vogue editorial featuring the new YSL Baroque manicure, using the collection. 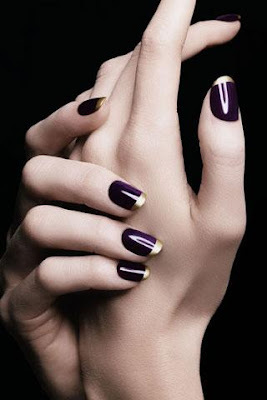 The gold and purple looks so amazing together in a modern version of the "French Manicure". The shades are a deep grape purple with high shine, and a shimmery, somewhat matte, dense, yellow gold. The formula is light/medium in weight, but very silky smooth with no streaking. Two coats are neccessary to get the depth of color you see in the photo. I achieved a similar look (admittedly by taking it to my manicurist) and I must say it was stunning - especially at night. Of course, if you're more into the gold, you can also reverse the manicure and have the gold on the base with the purple on the tips, but my personal favorite is the one seen left.